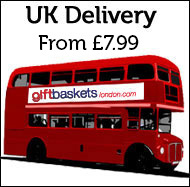 A neutral Basket at a popular price point. The perfect choice is you are unsure of the new arrival's gender. 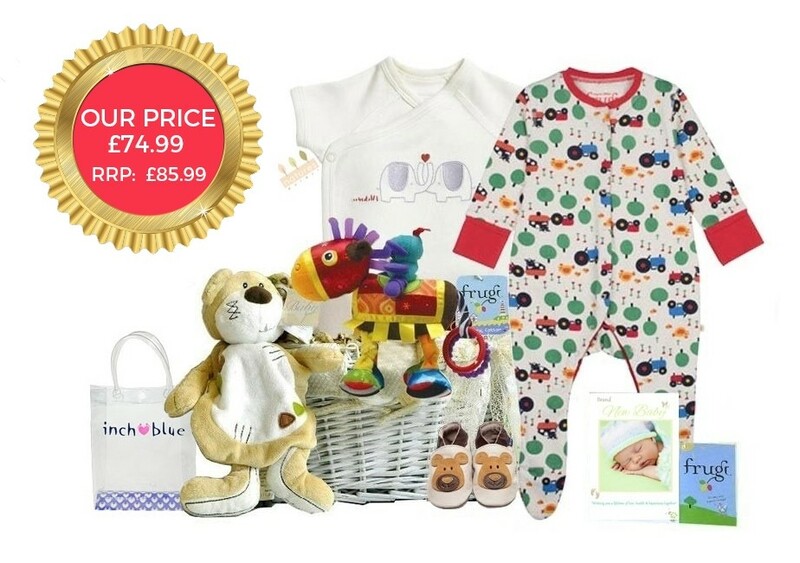 Filled with purely organic clothing from quality UK manufacturer's including a colourful babygrow, embroidered bodysuit, soft teddy bear leather shoes, a teddy blankie comforter, and an award winning developmental toy perfect for cots and prams. 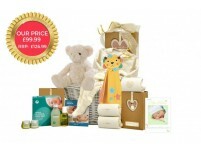 A beautiful organic gift basket with a teddy bear theme for a new baby. Filled with a collection of gorgeous clothing from the Natures Purest organic collection including a trio of 100% cotton bodysuits, sleepytime gift set, a super soft bath robe, a top selling blissful baby organic skincare giftbox, an adoreable baby's 1st Teddy Bear, and a duo of 100% Natural Baby bath and body skincare products. The perfect gift choice if you're not sure if baby is a boy or girl. It comes filled with a trio gift box of 100% organic body suits, a beautiful organic sleep suit & super soft bunny comforter from the newborn collection at Natures Purest. The Blissful Baby organic skincare gift set is complimented by an adoreable super soft teddy bear from the Suki baby collection. Your gift basket is finished with a baby girl gift card incorporating your personalised message, gift wrapped & decorated with hand tied ribbon.